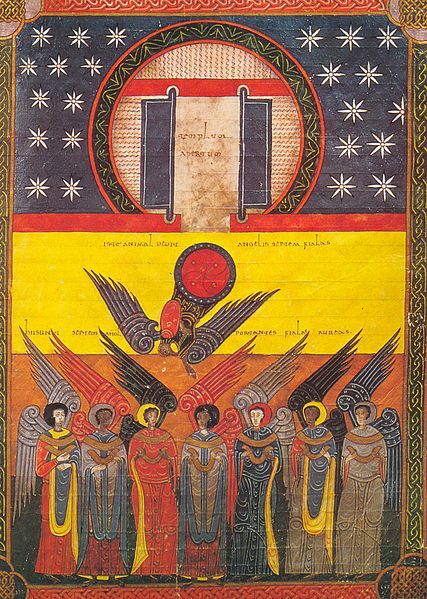 My Ph.D focuses on the illustrated copies of Beatus of Liébana’s In Apocalypsin, generally known as the Hispanic ‘Beatus’. Alongside Isidore of Seville’s Etymologiae, Beatus’s Commentary is regarded as a fundamental work of medieval Iberia, testified by its wide and continuous dissemination in this context, from the eighth to the thirteenth century. 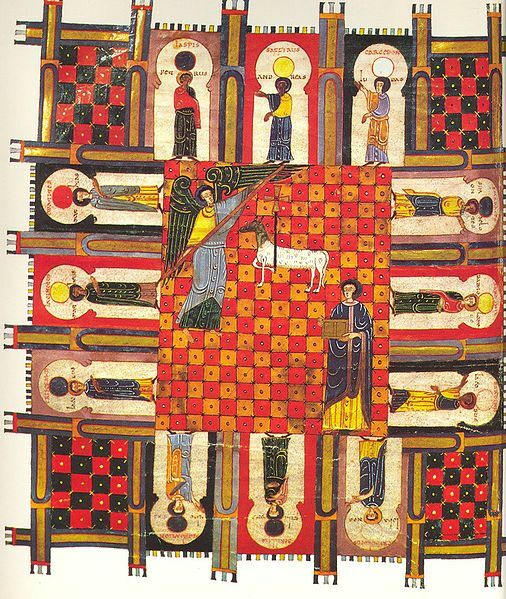 The New Jerusalem, Beato de Liébana, Commentarium in Apocalipsin, (codex of Fernando I and Doña Sancha), Biblioteca Nacional de España VITR./14/2/, f. 253v. As well as being amongst the greatest Hispanic bibliographic treasures, the ‘Beatus’ are similarly considered to be one of the most lavishly illuminated bodies of manuscripts in the western world. My project is an ambitious and rigorous re-examination of this corpus in its historical, religious and cultural context, investigating both the production and reception of these manuscripts. Building on this solid contextualisation, my research addresses the challenging questions of the purposes and impact of the ‘Beatus’ as an illustrated text, and aims to understand how scribes, miniaturists, and readers, may have interpreted them. Hence, this analysis will provide insight into how these remarkable books may have been used more generally, and by extension, will also shed light on the impact of the Apocalypse in medieval Iberia. I am currently starting the second year of my Ph.D in Durham University, with the sponsorship of ARTES Coll & Cortés Ph.D Scholarship. During my first year of research, I focused on the contextual aspects of the ‘Beatus’. I considered these manuscripts against the general panorama of illustrated Apocalypses, and have examined their origins, particularities, and relevance as one of the most complete Apocalypse pictorial cycles. I have also explored the context of book production in early medieval Iberia. A closer look at monastic literary culture, and library holdings, was a fundamental part of my research, which has enabled me to grasp better the significance of the ‘Beatus’ in this specific milieu, and to understand which other authors and texts were prominent for Iberian monasticism. I have also conducted primary source analysis. The study of the ‘Beatus’s colophons was the starting point, as these remarkable textual inscriptions, of unusual length and content, offer a glimpse into scribal and scriptoria practices in medieval Iberia. Most importantly, they provide precious information concerning the role of these manuscripts, and how scribes envisaged their production processes as important acts of devotion. The results of this analysis will be integrated into a chapter of my dissertation on the significance of the ‘Beatus’ in the landscape of medieval Iberian monastic culture. I have also focused on the textual analysis of Beatus of Liébana’s In Apocalypsin. One of my main goals in engaging with a work of such rich symbolism, has been to understand how its readers may have conceptualised and interpreted the Book of Revelation, and how this may have shaped their mentality and ‘imagination’. This analysis has been conducted in parallel with an examination of the Beatus’s iconographic programme, so as to observe how these images relate, on a primary level, to both the Scriptures and the Commentary. To assess the most suitable copies for this research, I concluded my first year with the study of the Beatus families, in order to comprehend the intricate textual and iconographic kinship between these manuscripts, which has been under discussion for many decades, chiefly in works by Neuss and Sanders (1931), Klein (1976), and Williams (1994). By and large, my first year of research was dedicated to fundamental contextual work, which has given me a solid foundation concerning the cultural and spiritual setting in which the Hispanic ‘Beatus’ were produced. Building on this knowledge, my second year will begin with a thorough and systematic analysis of the Beatus’s visual imagery, focusing on the role of symbols and allegory in these representations, so as to elucidate the possible function and meaning of these remarkable illustrated manuscripts. This entry was posted in ARTES, Scholarships and tagged 2015, Doctor of Philosophy, Illustrated Beatus, report, Scholarship on October 28, 2015 by tomnickson2013.